Can I take my bike on a train in Tokyo? A question I'm asked a lot by people new to Japan is "Can I take a bike on the train in Tokyo?" We'll you'll be glad to know the answer is yes, but there are some conditions which make it more troublesome than just wheeling your bike into the carriage. The generally accepted rule is that your bicycle must be sufficiently covered to prevent it from dirtying up your fellow passengers. Therefore, in the local vernacular, you have to "bag it". Most good bike stores will sell nylon bike bags, or "rinko bukuro" ranging from Y3,000 to well beyond Y10,000. The majority fold down to a size that fits perfectly into a bottle cage which makes them convenient to carry when not in use. Bicycle, bagged and ready to go. Obviously your bike is big and the bag is small, so in general it is best to remove both wheels from the bike and strap them either side of your frame with the straps provided with your bike bag. You might like to place some cloth around your frame where it comes into contact with your wheels to prevent scratching or rubbing. After your wheels are tightly secured, simply throw the bike bag over the whole package and run shoulder strap (also provided with your bike bag) from your headset to your rear fork or seat post for easier carrying. If you find yourself without a bike bag and needing to ride the train in an emergency such as a sudden storm, strong winds or tropical downpour, then drop into a convenience store and buy some garbage bags. Bag each wheel and your frame in individually and you're good to go. It has been rumored that there are cases in which you have to buy a special ticket to carry your bike on the train, but in 13 years of cycling around Japan I've never purchased one, so throw caution to the wind and only bother to buy one if you're asked by the station staff. Also, on city trains try to ride in the front or rear most carriages as you'll find a little more space there for your bicycle. If you're riding the shinkansen then try to secure seats at the rear of any carriage as there is just enough space behind the rear seats to slide in a bagged bike. If you're simply touring around the city I'd say avoid the trouble of bagging all together, as Tokyo is small enough that you can cycle from point A to point B in less time than it takes to bag your bike and take the train. Its only for those rides starting, or ending, outside the city that you should consider bagging your bike. Bicycles for use in cycling or sporting events if the bicycle is disassembled and placed in a bicycle carrying bag, or if the bicycle is a folding bicycle that has been folded and placed in a bicycle carrying bag. The complete list of JR luggage rules can be found here. Great. Thanks for the post. I retweeted it. @tomodachibrad. 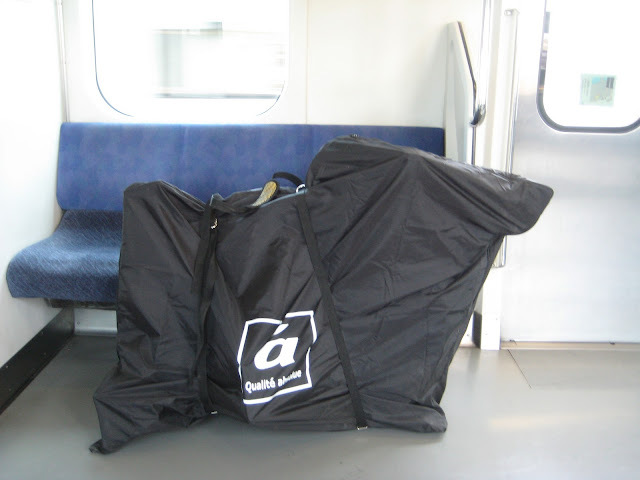 For further reference: I recently took a bmx on the train (rear hub frozen, unrideable) bagged up. Didn't have a wrench so had to leave the wheels on; the station guy was not receptive and wouldn't let me on though the package size was smaller than my mtb disassembled ... (rules are rules) Still managed to get it on by sneaking it over the fence behind a pillar. Excellent post. Very useful. Thanks. Great. Informative article. Thanks for sharing.